We’d love your help. 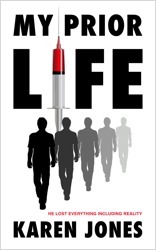 Let us know what’s wrong with this preview of My Prior Life by Karen Jones. To ask other readers questions about My Prior Life, please sign up. Written in simple language with deep insight, this book reads like something by Ken Keesey. Tom Brown is a somewhat introspective computer nerd who starts to question his reality when his life takes one unlikely turn after another. This is the story of how an entirely sane guy applies perfect logic to arrive at a mad solution. And when he takes the most final and drastic of actions, not only can you can understand how he got there, somehow it makes perfect sense. It was neat to read someone else's impressions of California.